Ready to start developing premium WordPress themes? 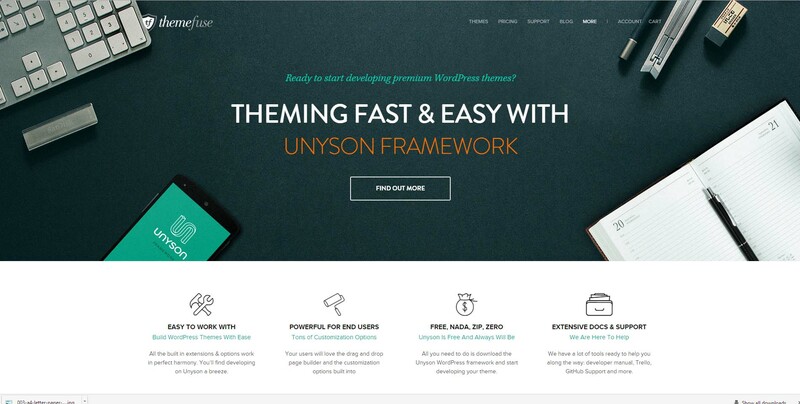 THEMING FAST & EASY WITH UNYSON FRAMEWORK. EASY TO WORK WITH. Build WordPress Themes With Ease. All the built in extensions & options work in perfect harmony. You’ll find developing on Unyson a breeze. POWERFUL FOR END USERS. Tons of Customization Options. FREE, NADA, ZIP, ZERO Unyson Is Free And Always Will Be. EXTENSIVE DOCS & SUPPORT.